Acti Plaka Apartments are located on the beautiful beach of Plaka, Naxos. They consist of 10 apartments, 6 of which are 2-room apartments whereas 4 are a 1-room apartment. Each apartment has its own private balcony, with view over the sea and the garden. 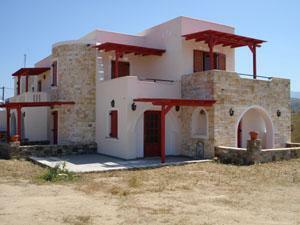 The units are conveniently located right next to a tavern .The bus station to Naxos town is approximately 350m away. Rooms/Facilities for Disabled, Free Parking.